All set up for my talk at the Frisian Academy. On the mud flats off Norderney. Away with the seals on Dune island, Heligoland. I’m now in the third year of my PhD in Creative Writing at the University of Essex, so this has been taking up most of my time. I am writing about the North Sea islands of Heligoland and the surrounding coastal area of Germany and the Netherlands. I’ve spent two months in the summer travelling to Leeuwarden, capital of the Dutch province of Friesland, the Dutch Frisian island of Terschelling, the German Frisian island of Norderney, and Heligoland itself. I interviewed various people who live and work on the islands and tried to find out more about the literature, culture and languages of the area (all very much more complicated than it first appears!). I was very kindly hosted for a few days by the Frisian Academy in Leeuwarden, where I gave a talk. While I was in Leeuwarden, I was interviewed by Hedwig Terpstra for the Frisian literary magazine, ensafh. 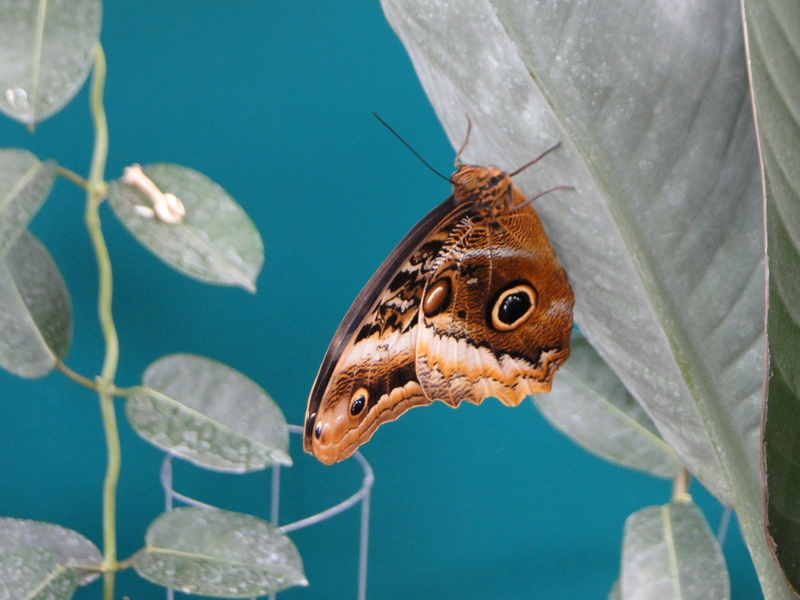 Hedwig has also translated my short memoir piece, “Handle With Care,” into Frisian, which is now on the website. It is an exciting and lovely thing to have my words appear in another language. I was very pleased to co-organise and host an evening of poetry at Ely Cathedral, in collaboration with the Ely Diocese Environmental Co-ordinator, Clare Redfern, as part of the Space@6.30 service series. Entitled, “Dark Reflections,” the evening was an invitation to reflect on poetic responses to environmental crisis, including a thought-provoking talk from priest-poet Malcolm Guite, always a charismatic presence, and wonderful poetry readings from Malcolm, Mary Livingstone and Fenland Poet Laureate Kate Arthur. I’ve also been continuing to co-host Fen Speak, along with Jonathan Totman. It’s been great to see our local open mic spoken word night go from strength to strength. We now have regular featured performers at our bi-monthly event, and we have been proud to host some quality poets and spoken word artists, including, this year, Stewart Carswell, Fay Roberts, Adam Crothers, Ash Dickinson and Ian McEwen, at our Ely venue the Babylon Gallery, as well as the Young and Adult Fenland Poets Laureate Sophie Lutkin and Kate Arthur in King’s Lynn. 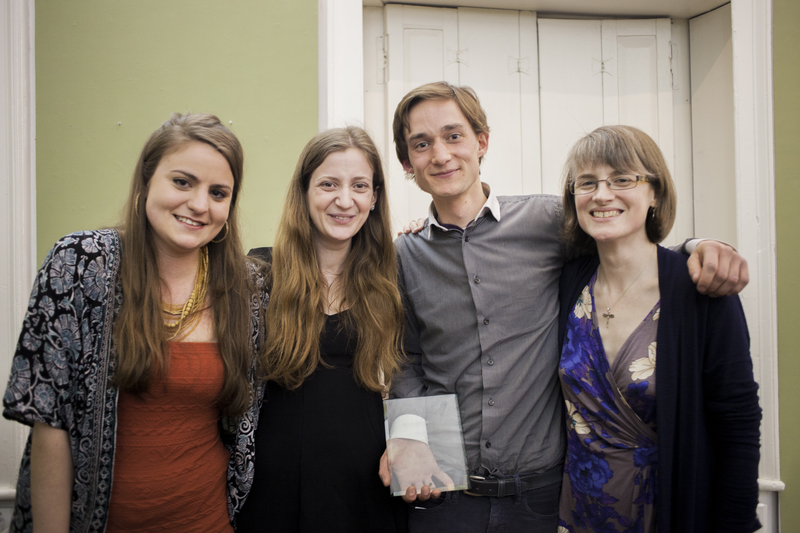 I also spent an unexpected but fun night on the judges’ panel to choose the second Cambridge Bard. The winner of both the judges’ and the popular vote was the talented storyteller Glenys Newton. In spring I ran another series of three creative writing workshops at March Library, which I hugely enjoyed. Although I don’t have much time for performing myself at the moment, I welcomed the chance to read at the In Other Words alternative literary festival in Cambridge, and the Fen Edge Festival in Cottenham. Along the sea wall at Bradwell on Sea. An annual update to my blog doesn’t seem all that impressive, but life does often get in the way of writing about it. 2016, tumultuous as it has been on the world stage, has been good to me both personally and professionally, and I can only be very grateful for that. 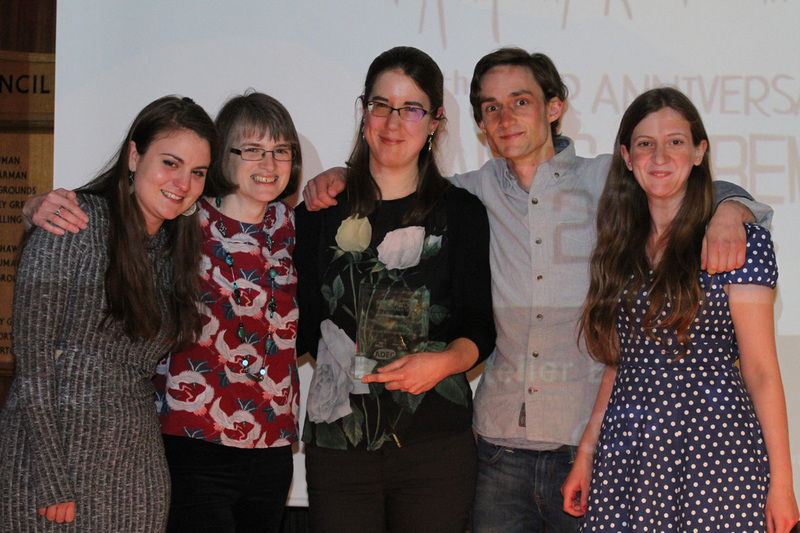 Organising the Fenland Poet Laureate Awards for the last time, in a big event to celebrate our fifth year! 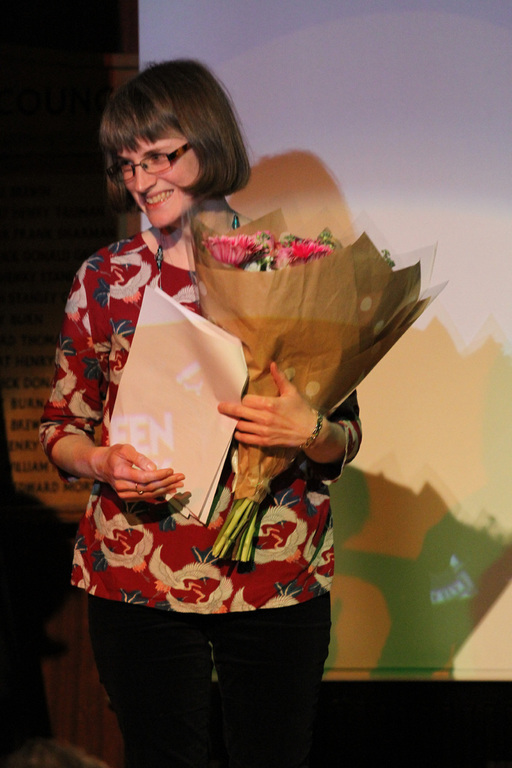 After a nail-biting contest, Mary Livingstone Totman was crowned the Fenland Poet Laureate for 2016. However, though I have bowed out from the team, the FPL Awards are still very much running this year, and there’s still time to get your entry in for 2017 – details on the splendid new website. 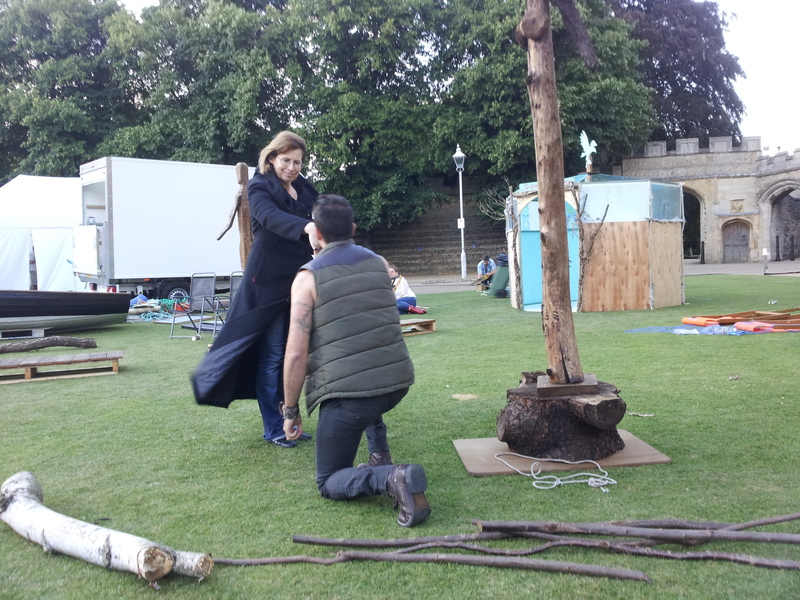 Over the summer I was given a hugely exciting commission, to write a play for Peterborough Green Festival, produced by Eastern Angles theatre company. It’s been one of my dreams to write for them, even though I’d not written a script since the nativity play I wrote for the church youth group in 1993… In the Wake of the Flood, a response to a potential future flooded landscape brought about by climate change, was performed in front of Peterborough Cathedral in August, and I was then asked to develop it for a performance of new writing, Engine Room, at the beginning of October. It was a fantastic experience all round. In November I got to read at Poetry in Aldeburgh, at the launch of the 3rd issue of The Fenland Reed, at the invitation of editors Jonathan and Mary Totman. 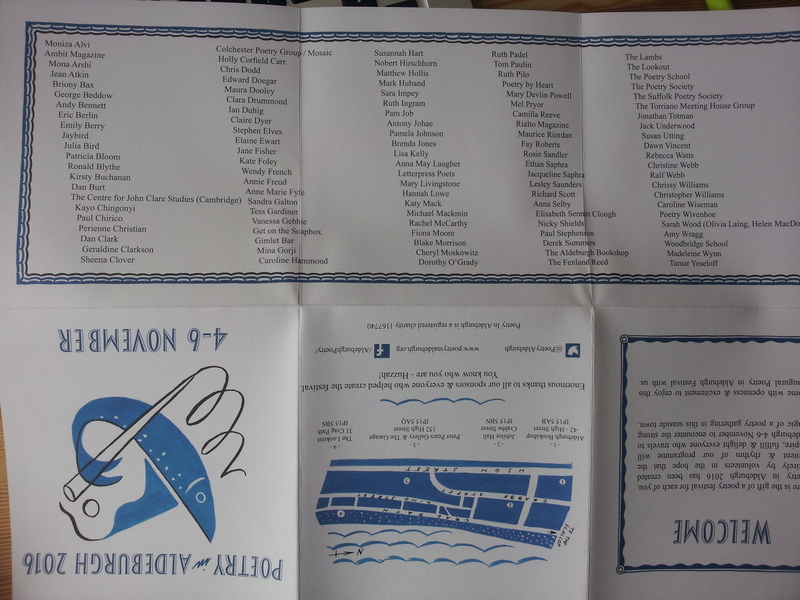 This was such a super occasion, in such a fantastic venue – and so many poets in one place! A real weekend to remember. I’ve been doing a lot of teaching and workshop leading this year, too, including two series of creative writing workshops at March library, and my first term of teaching English Literature to undergraduates. I am so far out of my comfort zone I am thinking of bringing my own supply of oxygen, but it has been enjoyable and rewarding and surprisingly full of comic moments. I am so very fortunate to be doing what I love, surrounded by so many dedicated and supportive people. Here’s to creativity and the gifts that literature can give us in an uncertain world. Here’s to 2017. After that, I launched into a very different experience as a consultant poet for Rachel Burn Dance for their performance, Threshold, based on Walt Whitman’s classic poem Leaves of Grass. It was the first time I had worked with a dance company and I was honoured to be part of the experience. 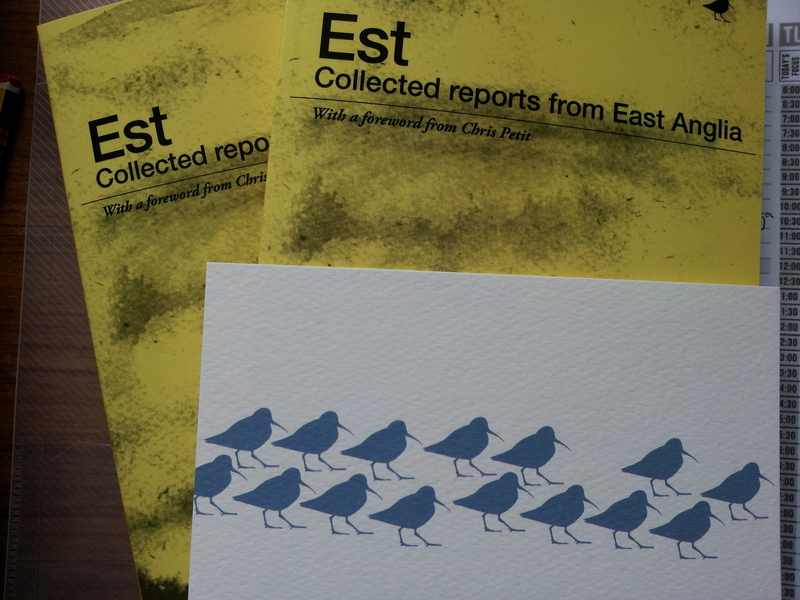 March saw the inaugural publication from Essex-based Dunlin Press, Est: Collected Reports from East Anglia, to which I had contributed. 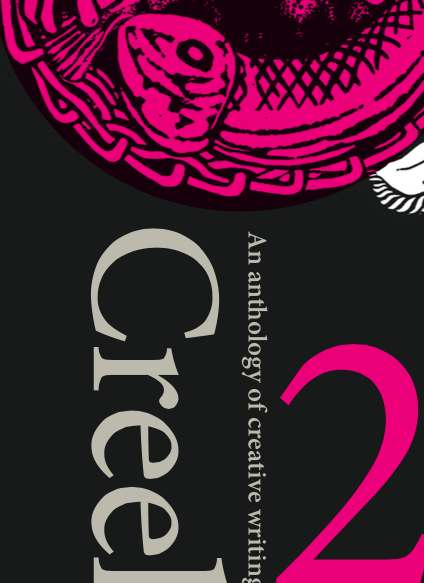 This beautiful anthology has garnered plenty of critical praise, including a special mention from Libby Purves for my essay, “Digging”, which she describes as, “a wonderful essay on Sutton Hoo and its ghosts”. You can buy your own copy via the website here. Another important event in March was the appointment of the new Fenland Poet Laureate, Jonathan Totman, who has proved such a fantastic choice in the months that followed! I am very proud that these awards, which I help to run, and which aims to encourage poets and poetry in the fenland area, is now in its fifth year! If you live, work or study in fenland, do consider entering – details are on the ADeC website here. My poetry reading at the Stained Glass Museum in Ely to celebrate an exhibition on the theme of Dylan Thomas’ work, and the launch of former Fenland Poet Laureate Poppy Kleiser’s splendid anthology, Poems for Peace, were other spring highlights, as well as taking part in Poetry to Go at Cambridge Literary Festival – enormous fun writing bespoke poems for the punters. Also in May, I enjoyed taking part in one of the nature writing workshops run by Lois Williams and one of my fellow MA Wild Writing graduates, Melinda Appleby, at the BTO headquarters in Thetford – an inspiring day at an inspiring location. The series of workshops, under the Breaking New Ground landscape partnership, culminated in a gorgeously produced pamphlet of poems, including my poem, “Homing”, and an exhibition which takes place in January in Bury St Edmunds – maybe take a look if you’re in the area? 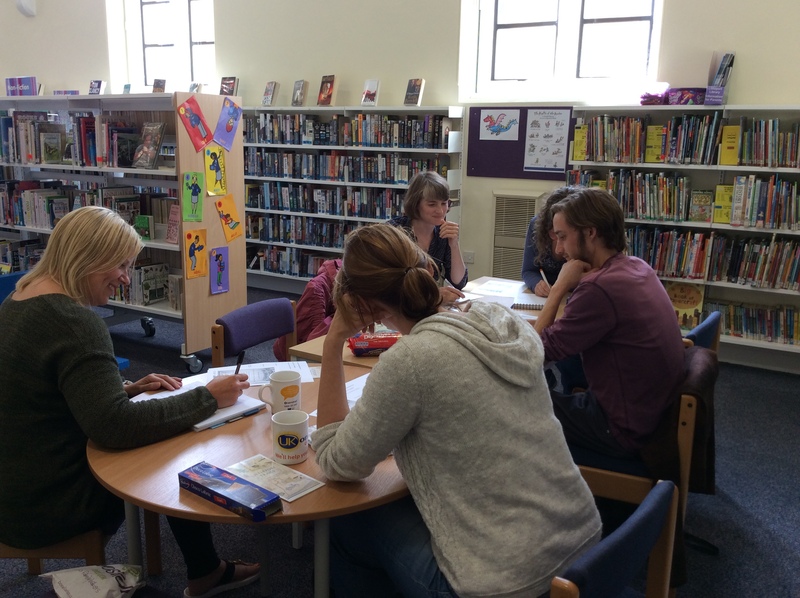 In September I ran a series of creative writing workshops in local libraries in Littleport and March. It was a tremendous experience and I hope to be doing some more in 2016. A particular memorable moment was getting the participants to write an Anglo Saxon riddle and then guess each other’s answers! Fantastic fun. So many memorable times, but perhaps the most moving was singing at the first performance of “A Fenland Christmas,” my poem which was set to music by talented local composer John Lawson Baker, who died earlier this year and is much missed. Although I am sorry it was never performed during his lifetime, it had a very creditable performance by the St Peter’s Singers at the Advent Carol Service this year at St Peter’s Church in Ely. I think that’s quite enough excitement for one year… I am very lucky to be able to do what I love and work with such incredible people. Thank you for reading this blog and for the kind comments you have sent or posted. I wish you all a creative 2016. I spent a lovely day yesterday with writers Melinda Appleby and Lois Williams in the beautiful surroundings of the the old Nunnery in Thetford, now the headquarters of the British Trust for Ornithology. Melinda is one of my fellow Wild Writers from my MA course at the University of Essex, and she and her colleague put on a thought-provoking, attractive and well-organised day’s creative writing workshop on the theme of “Bringing the Spring”. Looking at poets from John Clare to Ruth Padel, we explored different ways of writing about spring migration – as celebration, elegy, and as analogies with human situations. Paul Stancliffe from the BTO joined us for a while to give a short talk about migration and the research done by the BTO which is helping us understand for the first time some of the hidden mysteries of migrant birds. Sadly, so many of the birds which used to represent the coming of spring in years gone by are now under threat by loss of habitat and climate change: including swifts, turtle doves and cuckoos. The writing exercises provided throughout the day were well thought out and I personally found them all very productive – I managed one draft poem and ideas to develop for two more, sufficiently good that I want to progress with them now I am back home again. The indoor work was relieved by a couple of trips out into the grounds and down by the river, the Little Ouse, despite the almost relentless rain. Once, back in 2011, I was lucky enough to see an otter parent and cub on this spot, while on a bird ID course run by the BTO (me, not the otters) – I wasn’t expecting that to be repeated, and it wasn’t… However, keen naturalist Ali showed me the mayflies sheltering under the nettle leaves – somewhere I would never have thought to look for wildlife. All in all, a splendid day out. There are still places left on Melinda and Lois’ forthcoming writing workshops, held at different venues in Breckland, and I would very much recommend them. As part of the Breaking New Ground project, these subsidised courses are at very low prices – an absolute bargain. Poet-in-residence – is this for you? “Just write and ask” – Abegail Morley passes on advice about residencies. I’m currently Poet-in-Residence for the National Trust at Scotney Castle. I decided to do this after my last collection as a way of exploring something new and also to shift the direction of my writing. I’ve spent a lot of time there, either on my own or with friends – it’s a good way of getting extra ideas, especially from friends who ask a lot of (difficult) questions. I’ve chatted to volunteers, employees and pounced on visitors. My work focuses on the ruins, the moat in particular. I recently read about Jacques Benveniste and his theory about water (which later became known as the “memory of water”). It’s known as the “memory of water”. 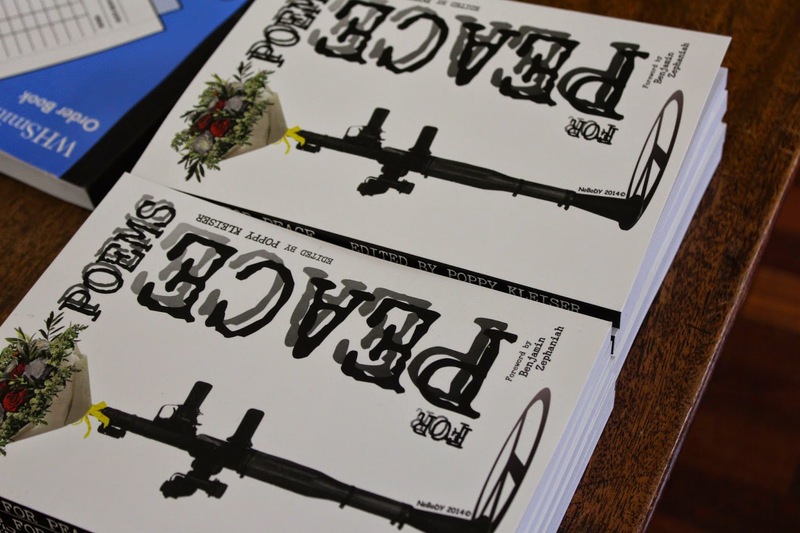 Friday 10th April saw the long-awaited launch of Poems for Peace, an anthology of poems by writers in the East Anglian area (and beyond), “inspired by the futility of war throughout the ages” [from the jacket], edited by the 2014 Fenland Poet Laureate, Poppy Kleiser. The launch, held at the Wisbech and Fenland Museum, was lively with poets, press and guests crowding the galleries, and the presence of Benjamin Zephaniah, who wrote the foreword to the book, was an added excitement! 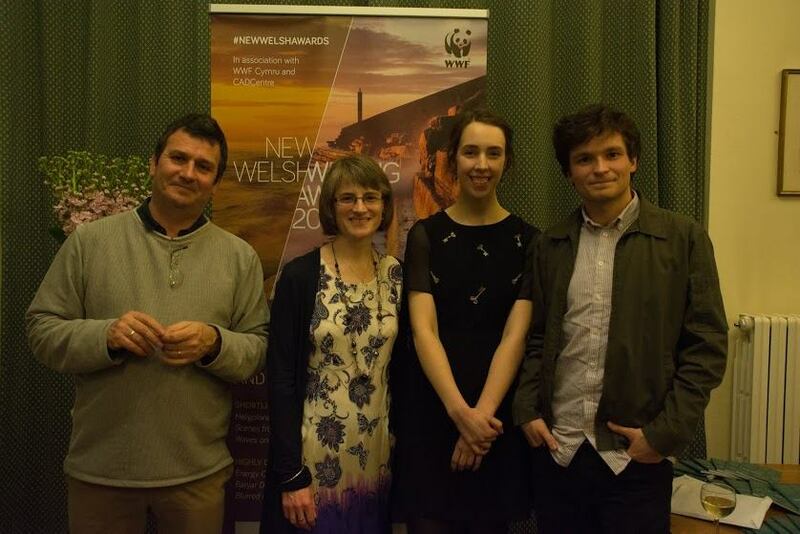 Refreshments were followed by readings by the poets, of which I was very pleased to be one, with my poem, “Heligoland,” inspired by those islands’ dramatic history, which I have been studying over the past year for my MA dissertation in Wild Writing. The collection itself includes an impressive variety of styles and subject matter – it is very easy to make an anthology of war poetry repetitive and unrelenting, but these poems provide a thought-provoking exploration of many different aspects of war and resistance, from all over the globe. Our usual Fen Speak open mic night at Ely’s Babylon Gallery was its usual creative mix from the sublime to the silly. Hosting it single-handedly in the absence of Leanne Moden, I was glad to find the Fen Speak audience was as friendly and responsive as always. Why not come and join us next time? 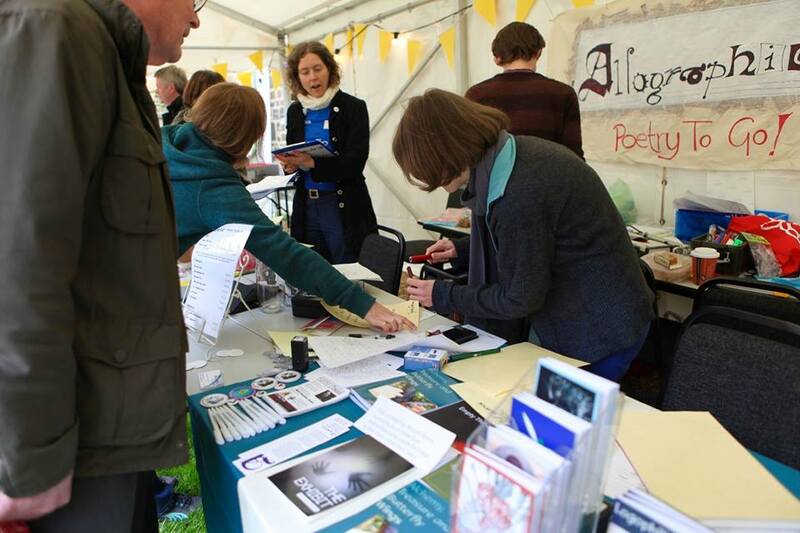 Last weekend saw me at Cambridge Literary Festival, with Fay Roberts’ Allographic Poetry To Go team, cooking up poetry to order for an increasingly intrigued clientele. With a splendid array of different presentation options and a varied menu of poetic forms, the event was fast, furious and fun. It was lovely to see the reactions of the customers to their poems – apparently, I made one lady cry, “but in a good way”. On Saturday 21st March, I attended the Writers’ Day at Ely Library, organized by Rosemary Westwell. I had been to a previous event in Birmingham library last autumn, which included a variety of interesting speakers, talking about various aspects of writing, including self-publishing, marketing and co-authoring. Unfortunately, I wasn’t able to attend the full day this time, but I did manage the afternoon, at which I spoke to a very engaged and enthusiastic audience about Fen Speak and the Fenland Poet Laureate Awards, and read from my collection Fur, Feather and Fen. The following Tuesday, I performed a reading in a rather more unusual environment, the beautiful Stained Glass Museum in Ely Cathedral, at the kind invitation of curator Jasmine Allen. Tucked into one of the towers, this is a hidden treasure house of glass art throughout the ages. Currently it is hosting an Exhibition, “Harmony”, a series of glass panels which were shortlisted in a competition in 2014 to celebrate the centenary of Dylan Thomas’ birth. 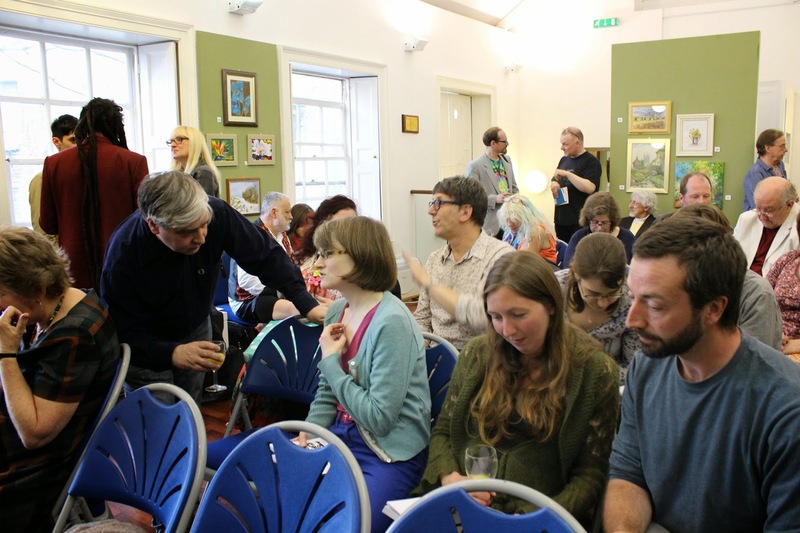 As the museum’s guests nursed their glasses of wine at a private view and perused the artwork, I attempted to draw together the art and Thomas’ poetry by reading some of his poems, as well as a few of my own. I was rather fearful of putting myself in the way of invidious comparisons with one of the great poets of the twentieth century, but I received some very positive feedback on the way my choice of poems had helped bring out the themes of the exhibition, and of Thomas’ own work. I do very much enjoy these collaborations between different art forms and artists, and hope there will be more opportunities in the future. Do go and look at the exhibition if you are in Ely – it is free to view. And then, on Friday 27th March, the Fenland Poet Laureate Awards! 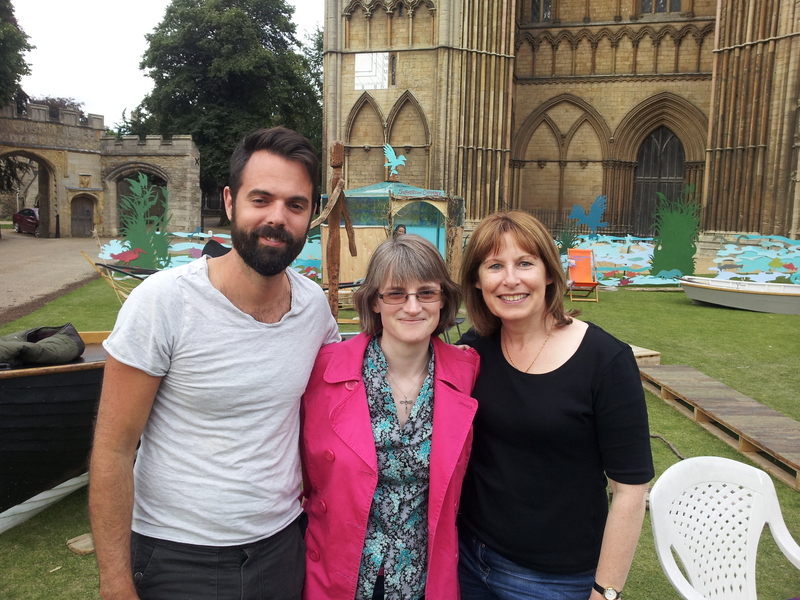 Congratulations to our new Fenland Poet Laureate, Jonathan Totman, and Young Fenland Poet Laureate, Harriet Munson! 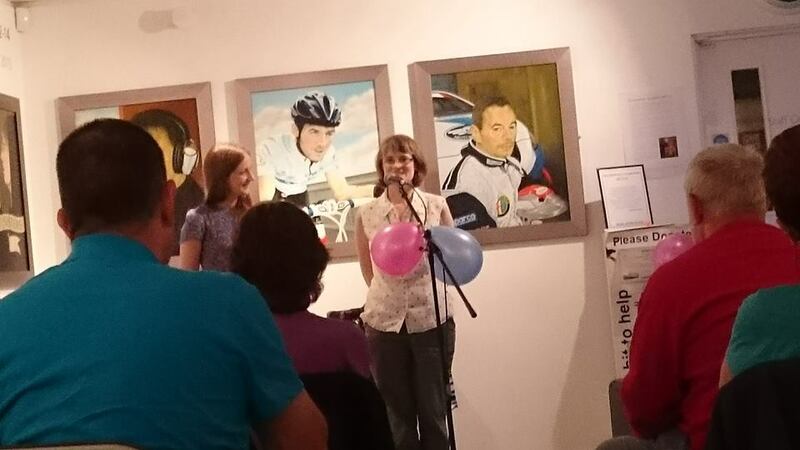 It was a hugely fun night at the Wisbech and Fenland Museum, hosted by the unflappable Leanne Moden and with poems from judges Poppy Kleiser and Pete “Cardinal” Cox, as well as the shortlisters themselves. I’m very looking forward to working with Jonathan, an extremely talented poet, during his forthcoming year in post. 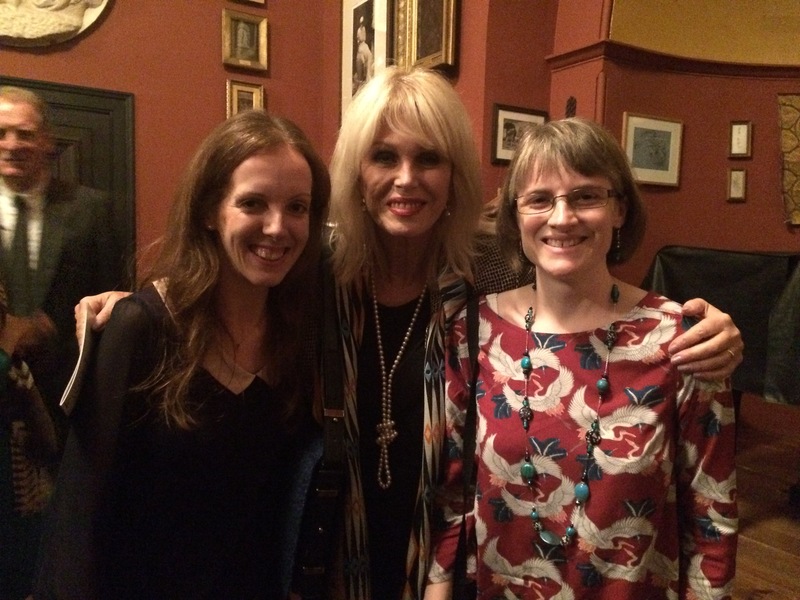 A detailed report on this glittering event can be found on the Atelier East website, and Jonathan’s own blog can be found here – take a look!